Style meets function to create beautiful, quality cabinetry and furniture for your kitchen, bath and every room in your home. 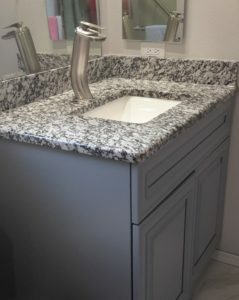 You choose the color and counter top or we help with the design. Style and function meet quality. A practical makeover for a high traffic area of your home. 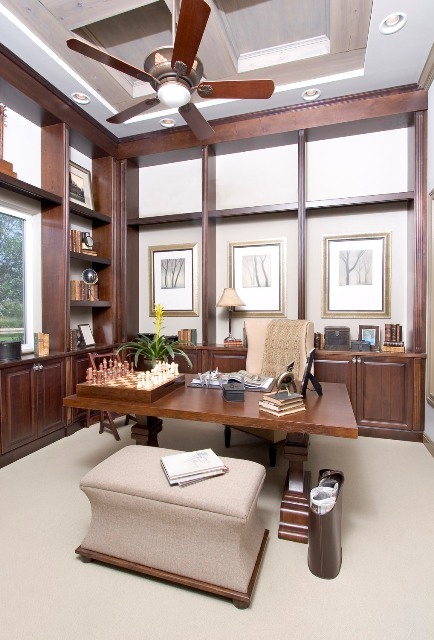 Your built-in home office can be designed with any of the styles and features from DeGeorge. Special accessory pieces, such as keyboard trays and file drawers, help you get the most out of your space. How Do You Use Your Kitchen? Kitchen design has been dominated for decades by the concept of the “work triangle” created by the refrigerator, sink and stove. The idea still works for one lone cook, but it fails in the face of modern living. In a search for an updated approach to designing kitchens, Krasner visited restaurants, where cooks work in zones dedicated to specific tasks. She began to think about how this type of organization could apply to home kitchens. Ultimately, she defined four zones or work stations in the home kitchen: wet, dry, hot and cold. Each zone anchors an appliance or function and each has its own storage and space requirements. The wet zone includes the sink, dishwasher and any appliances linked to water – like the coffee maker and grinder or an electric tea kettle. Other items like a salad spinner, colander or cleaning supplies can be kept here. The dry zone typically requires more space because this is where most of the food preparation and assembly is done. It calls for a lot of counter-space with easy access to the refrigerator. Other things to consider include cupboards, drawers, a storage pantry and non-refrigerated storage space for perishables like fruit and bread. The hot zone houses the range, the oven and toasters. It also includes storage for the pots and pans, baking dishes and sheets, cooling racks, pot holders, spatulas and mixing spoons and bowls. The refrigerator anchors the cold zone. Storage containers and plastic wraps for leftovers are kept nearby. Krasner suggests anyone renovating or building a kitchen keep the concept of zones in mind. But just rearranging items can be a big help too. Krasner recommends providing a little extra protection to wood floors in the wet zone, especially in front of the sink. A tile insert can be laid in that spot. A rug that can be thrown in the washing machine or a canvas floor cloth are also good choices. Hardwood butcher block is a nice complement to the dry area. A coating of food-safe oil is needed if the surface will be used for chopping, Krasner says. In the wet zone, a little extra protection from moisture (a coat of well-maintained urethane) goes a long way for hardwood countertops that will not come into direct contact with food. Whether you're updating an existing space or building your dream kitchen, consider these questions of lifestyle and function. Your answers will shape nearly every choice you make about your new kitchen, from layout and lighting to furniture and flooring. A kitchen design professional's help can be invaluable during the entire process. Organization is essential. Consider conveniences such as a second sink or a work island for efficient activity especially if there’s more than one cook at home. Also consider your food preparation style. A gourmet cook needs far more space and uses a wider variety of appliances than a "basics-only" cook. 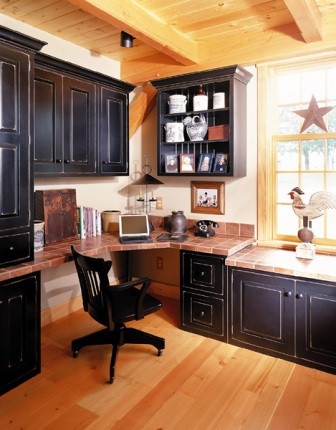 For bread-making or candy-making projects you may want a special work center. How you use an appliance will determine its location. If you use a microwave to cook main course dishes each day, place it front and center. But if you use it only to reheat leftovers or make popcorn, place it in a less frequently used part of your kitchen. If so, you may need: an uninterrupted counter top; a table to stage a buffet; a second oven or warming drawer to keep foods toasty; or an elegant wood wine rack with space for hanging glassware. Also, a desk comes in handy when planning elaborate menus. Is easy maintenance your priority? If you hate to clean, choose carefree materials, such as polyurethaned hardwood floors and hardwood cabinets because they are less likely to show fingerprints and can be wiped clean with a damp cloth. Look for light-stained cabinet doors with smooth surfaces that don't collect dust or require detailed cleaning. Is your kitchen Grand Central Station? Is your kitchen used exclusively for cooking? Or is it the family gathering spot for dining, snacking, paying bills, doing homework, conversation and relaxation? Do you want a kitchen TV or radio? How about storage space for cookbooks, note pads, and phone directories? One way of increasing your kitchen's flexibility is to have it open to an adjacent living area. Wood mouldings, paneling, wainscoting, chair rails and other decorative details can seamlessly connect these spaces. Ceramic tile is an especially good choice for families because they stand up to spills and other wear-and-tear. What are your family's special needs? Do family members have physical limitations, such as arthritis or poor eyesight? Account for these when planning work areas, storage and lighting. You may discover a need for child-safety closures, convenient countertop heights for very short or tall family members, and roll-out cabinet trays that can be opened with a toe-kick. Although kitchens have evolved into true living spaces, there are still "tried and true" principles of kitchen design that haven't really changed over the years. Even with all of the guidelines, keep in mind that it is important to leave your personal stamp on your kitchen. Don’t be afraid to get creative. Bend the rules a bit here and there to create a kitchen with interesting eye appeal. Your designer will be happy to make suggestions, like using cabinets with varying heights and depths, open shelving and see-thru door fronts, mouldings and other features that will give your kitchen its own personality. There are really only five fundamental "shapes" of kitchens. U-SHAPED. Cabinets and appliances are arrayed along three walls. This works best with the sink in the center of the "U" and the refrigerator at one end of a counter. L-SHAPED. Cabinets and appliances on two walls that meet on a corner. CORRIDOR. Cabinets and appliances on two facing walls. It's helpful here to have the sink and the stove on the same counter. OPEN PLAN. The traditional kitchen area is enlarged to include the family room, a dining area, and other spaces for relaxing or entertaining. ONE-WALL. Also known as a galley kitchen, all cabinets and appliances are along a single wall. One of the principles of kitchen design is creating an efficient and comfortable pattern of movement through the kitchen. The "work triangle," as it is known, is the shortest walking distance between the three primary work points—the refrigerator, primary cooking surface, and primary food preparation sink. 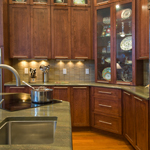 It is important to emphasize "primary" because many kitchens today feature multiple cooking surfaces and sinks. Experts recommend that the work triangle should cover a route of no more than 26 feet, with no single leg of the triangle shorter than four feet or longer than nine feet. If the kitchen features islands or peninsulas, they should not intersect the work triangle by more than one foot. If the kitchen has only one sink, it should be located between or across from the cooking surface, preparation area or refrigerator. And, if two cooks are working at a time, two work triangles should be in place, although one leg of both triangles can be shared. A kitchen design professional will advise you on the many, time-tested guidelines to help ensure efficiency, safety and comfort. These basic planning principles run the gamut and include how much space to leave for walkways, work aisles, seating and counters. They also cover minimum cabinet frontage depending on kitchen size, appliance placement, ventilation, counter heights, work center configurations and a host of other important considerations. For example, if you follow these guidelines for a smooth-functioning kitchen, you will leave at least 18 inches of counter space on one side of the sink and 24 inches on the other. You'll be sure the dishwasher is positioned within three feet of the sink and you will give yourself at least three feet of counter top for food preparation. Kitchen design expert Deborah Krasner believes that form follows function, and has taken the work triangle one step further. She has developed the concept of kitchen zones, spaces that are anchored by a major appliance or function. Her conclusion is that if a kitchen doesn't function efficiently and effectively, it doesn't matter how fabulous it looks. For example, the wet zone not only includes the dishwasher and sink, but also adjacent storage for items used in that zone like coffee makers and blenders. The hot zone, as you might imagine, includes the oven and cook top along with the host of pots, pans, and other items used for preparing food that ends up on the cook top or in the oven. Finally the dry zone is anchored by a food preparation area. This area typically requires a long run of countertop with plenty of storage for pantry items—non-refrigerated foodstuff like breads, cereals, snacks, and fruits. Ideally, says Krasner, the dry zone should be located along the same side of the work triangle as the refrigerator. What's your style? With the help of cabinets, you can create a kitchen that reflects your personal style. Remember, there are infinite varieties to choose from. A few of the styles available include: Flat panel or Recessed square, Raised panel, Mullion, and Cathedral. With over 56 years of excellence in customer satisfaction and being the nation's only full service ceiling, flooring, and cabinetry company, Degeorge has maintained a reputation of the highest quality for your family. Factory direct products for your kitchen, bath, living, dining, family, great rooms, bedroom/master suite, and study. Our Quality is never compromised!